The electronic life and its uncountable musical landscapes conceal always these small marvels hidden in the meanders of the forgetting. Logic Gate is one of these pearls. 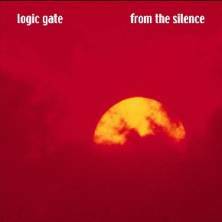 Musical entity founded by Steve Grace, Logic Gate released a first album in 2003; “From the Silence”. Album strongly recommended by the famous EM webzine Electroambient Space (Huge thanks to Phil Derby), “From the Silence” is a splendid album with the perfumes of vintage EM built around the bewitching clouds and the charming flutes of marvellously musical Mellotron, as well as on heavy movements of sequencers from which the loud circular rhythms stamp the airs of their tenebrous approaches. All here will have recognized the musical imprints of Tangerine Dream and of their psychedelicosmic years. Clogs of mists slam in the heavy winds of ether. Eventually molding an ascent made languid under a heavy soporific cloud, these knocks of clogs, which remind me with delight Thierry Fervant's Universe, exchange a measure which fainted in order to switch shape with a heavy pulsing bass line and its ions jumping lazily into the caresses of hyper foggy Mellotron. And so "Code Red" invites us in a journey in the time of Tangerine Dream, period Baumann-Franke-Froese. A delicate harmonious line espouses the uncertain march of a heavy rhythm and of its chords which skip of the end of their notes on a pond frozen by iodized gases. The lines of rhythms and harmonies are add and are compress to form a morphic symphony where old analog tones, as well as absent voices, spread their phantom veils on a 1st half which drowns itself in its fogs of Mellotron. The 2nd part infiltrates our ears with notes of an electric piano which dance in a delicate epitaph choreography. Fragile, these glass arpeggios interlace their harmonies in the pulsations of a sequenced bass line and in the prismic breaths of another line of sequences to gleaming arpeggios. Like an architect of minimalist structures, Steve Grace stacks his lines of harmonies with a swarm of related tones to unite them within a weighty line of sequences and his black ions which jump in a sort of imps figure into a rhythmic structure as slow as heavy whose obvious morphic charms harmonize themselves with the breaths of Mellotron to nasal evanescent harmonies. A soft and poetic flute opens the title-track which hears its shrill breaths be immediately sprayed by an iridescent mist. Heavy pulsations are skipping with uncertainty, moulding an undulatory rhythmic approach which embellishes itself of jingle of cymbals and floating chords of an electric piano which sings in lunar vapors. We would believe to be in the psychedelic spheres of Pink Floyd (Ummagumma) and Tangerine Dream (Encore) with this throbbing and semi-floating rhythm which welcomes in the strikings of percussions drumming an even more hallucinogenic measure. An oniric fog moderates the storm, plunging "From the Silence" into a brief ambient passage where the Mellotron subdivides its lines of mists and voices. Another line of sequences emerges, cutting the gliding horizon with deep circular keys which draw a boiling up-tempo where hangs onto constantly the morphic harmonies of the Mellotron and some synth pads à la Logos. The first minutes of "Biomorph" are kissing the lunar tranquility coming from the deep harmonic fogs. Then comes a beautiful flute and its enchanting singings to decorate this seraphic pattern that a soft bass line caresses of its delicate pulsations, carrying the first dream of "Biomorph" under the falls of white noises. A mislaid note draws scattered circles which are eventually interlaced to forge a heavy circular rhythm which gulps down at the passage some tinkling notes of which the ringings marry the slow circular movements of Mellotron gusts. “From the Silence” deserves to be heard loud and clear! It's a superb album of an EM as much musical as poetic which walks on the paths of the mythical Berlin trio without ever falling into the trap to be just a pale reflection. Behind his coat of Logic Gate, Steve Grace manages the improbable bet to seduce with a style that several have drained by dint of copying without wanting to give effort to embrace any originality. It's splendid and highly recommendable EM for those who miss the old days and those who enjoy the music of Jim Kirkwood and Arcane.